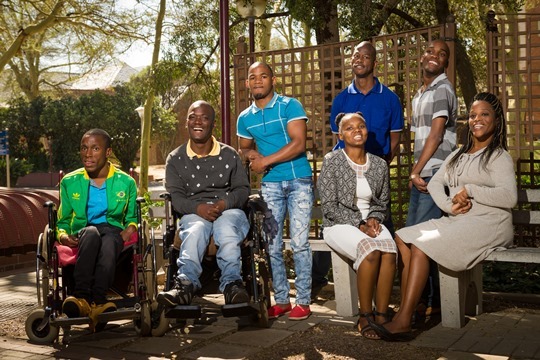 The Centre for Alternative and Augmentative Communication (Centre for AAC) at the University of Pretoria held its 13th Fofa Communication Empowerment Programme week for young people with severe communication disabilities who use alternative forms of communication, such as speech-generating devices that use text-to-speech technology. Fofa is a Northern Sotho word which means to fly or to soar. The programme is aimed at giving young people who experience severe speech difficulties an opportunity to improve their communication skills, and, by doing so, gain agency over their own lives. The focus of the 2018 programme was on communication skills, human rights and advocacy, and giving young people the tools to be able to tell their story and stand up for their rights. Young people with severe communication disabilities (and their personal assistants) from across the country attended the programme, which included an exhibition of their photography that allowed them to tell a powerful story through a process called Photovoice, led by Dr Alecia Samuels from the Centre for AAC. They also attended daily seminars and training workshops at the Centre for AAC, and then had the opportunity to practice their new communication skills by interacting with students and staff from different university departments, and taking part in campus life, including a visit to Sci-Enza together with students from House Humanities. Additionally, the group was taught about social media and how to interact with the press. The reason for this was to empower youth who cannot speak with strategies to challenge and change perceptions, practices and policies that marginalise and side-line not only them, but also others with disabilities in their communities. 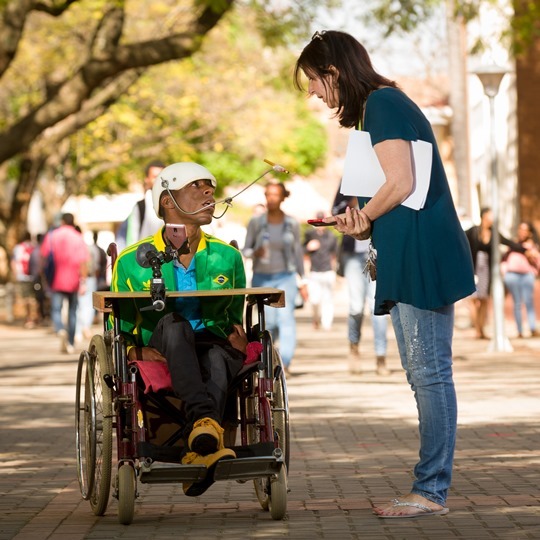 Dr Kerstin Tönsing, Fofa Programme co-ordinator at the Centre for AAC, explained the importance of the Fofa Empowerment Week, saying, “There is not much hope for young people in South Africa who cannot speak due to severe disabilities. They have significantly fewer chances to receive an education, are less likely to find a job, and are more likely to become victims of crime and abuse. The ability to communicate, however, opens new doors and provides them with an opportunity for a better life. We want to empower them to find their voice and we do not only want them to improve their communication skills but we also want to encourage them to become active and contributing members in their communities by showing them options for entrepreneurship, employment and community participation. The culmination of the training week is an opportunity to formally engage with the campus community on the final day of the training week – this year through the Photovoice exhibition. Here they have the platform to demonstrate the skills they gained through the training and also inform the UP community about their experiences, their new discoveries and future dreams. In this way, they not only focus on their own empowerment and growth, but contribute their voices to raising awareness and advocating for positive change for people with different abilities”. Mr Rikus Delport, director of the Department of University Relations, conducted media training for the group. He explained that it is essential for persons with disabilities to understand their rights within the media landscape, and emphasised the importance of persons with disabilities advocating for their rights and fair representation within the media as well.